This is the meal of the moment for me. 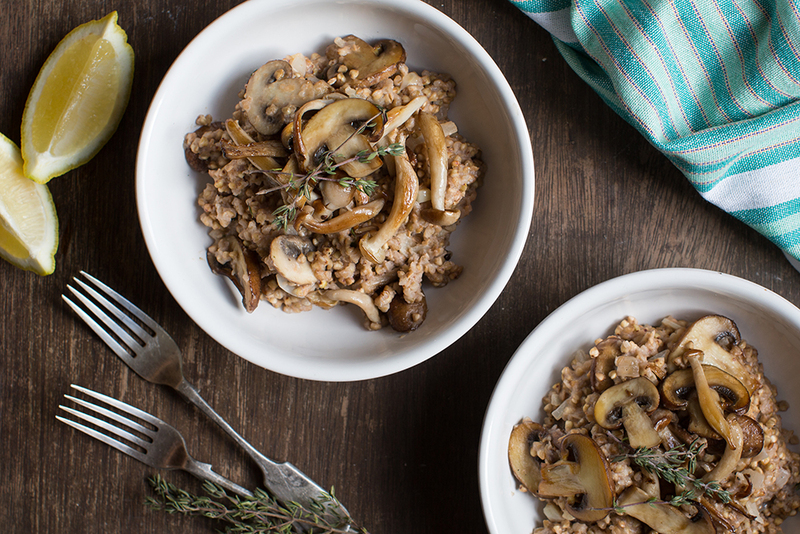 Buckwheat and Mushroom Risotto, gorgeous and comforting as the days get shorted and the winter sets in. Buckwheat is a staple Eastern European food, an ancient grain with a long history. While many people think that buckwheat is a cereal grain, it is actually a fruit seed that is related to rhubarb and sorrel making it a suitable substitute for people who are sensitive to gluten containing grains. 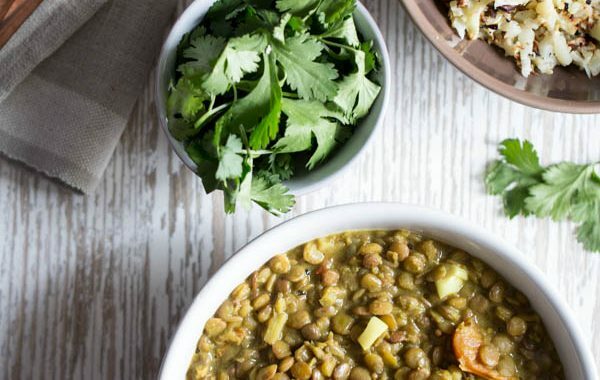 This amazing seed is packed full of nutrients; it provides a high source of amino acids, vitamins, minerals and antioxidants with few calories. While rich in plant proteins necessary for our body’s repair and regeneration, buckwheat is also high in fibre, making it an excellent food for a healthy digestive system. The number one killer in our Western civilisation is heart disease. Buckwheat is particularly beneficial when it comes to heart disease because it contains many flavonoid compounds which exert lipid-lowering activity, help maintain blood flow, keep platelets from clotting excessively and protect LDL cholesterol from free radical oxidation. Buckwheat is also rich in magnesium, which also helps relax blood vessels, improving blood flow and nutrient delivery while lowering blood pressure—the perfect combination for a healthy cardiovascular system. You can use whatever mushrooms you like in this. I vary it, sometimes using shitake, wild mushrooms or just standard button mushrooms. 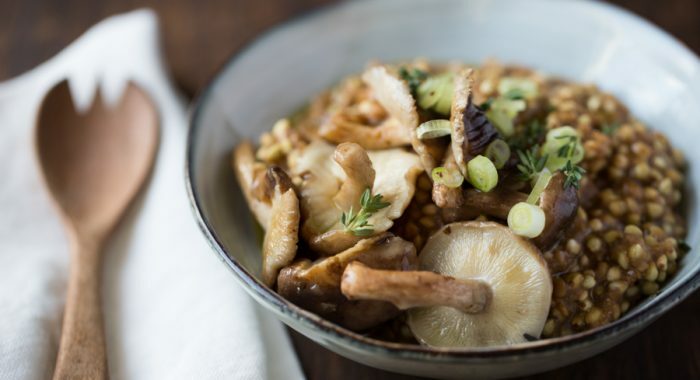 It’s a great time of year to be including mushrooms in our diet as mushroom help boost our immune system. In doing this, mushrooms are also beneficial in cancer prevention. 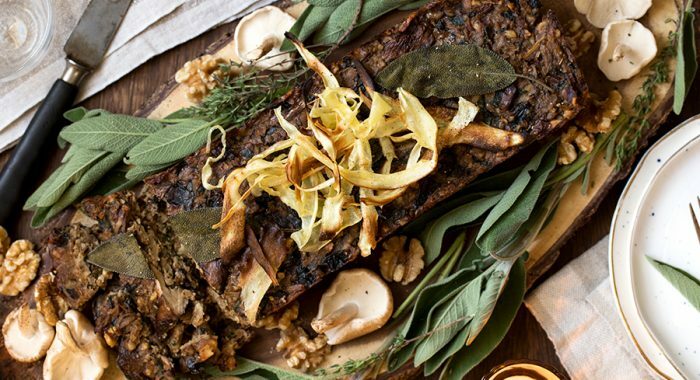 Due to the significant presence of Beta-Glucans and Conjugated Linoleic Acid, which both have anti-carcinogenic effects, research is showing that mushrooms may help prevent both breast and prostate cancers. Linoleic acid is particularly helpful in suppressing the harmful effects of excess oestrogen which is often the prime causes of breast cancer in women. Beta-Glucans, have been shown to inhibit the growth of cancerous cells in cases of prostate cancer, and numerous studies have shown the anti-tumor properties of mushrooms when applied medicinally. I love the power of plants!!! 200g mushrooms – sliced – you can any mushrooms you like. Heat a knob of coconut oil in a large pan with a lid, on a medium heat. Add the onion to the pan. Allow the onion to soften then remove the leaves from 5-6 sprigs of thyme and add to the pan. Add the buckwheat and season with salt and pepper. Mix well and allow the ingredients to sauté for 2-3 minutes. Pour in the vegetable stock and two of the garlic cloves and allow to simmer with the lid on for 5-8 minutes. Buckwheat cooks really fast! Meanwhile, in a separate frying pan, heat a knob of coconut oil on a medium/high heat. Add the mushrooms to the pan with the third garlic clove. Place in a few sprigs of thyme and fry all together until the mushrooms are soft and golden. Add the lemon juice and coconut milk to the buckwheat risotto, stirring on a medium/high heat. Continue stirring for 5 minutes until the buckwheat is soft and the mixture is thick and creamy. Add salt and pepper to taste. 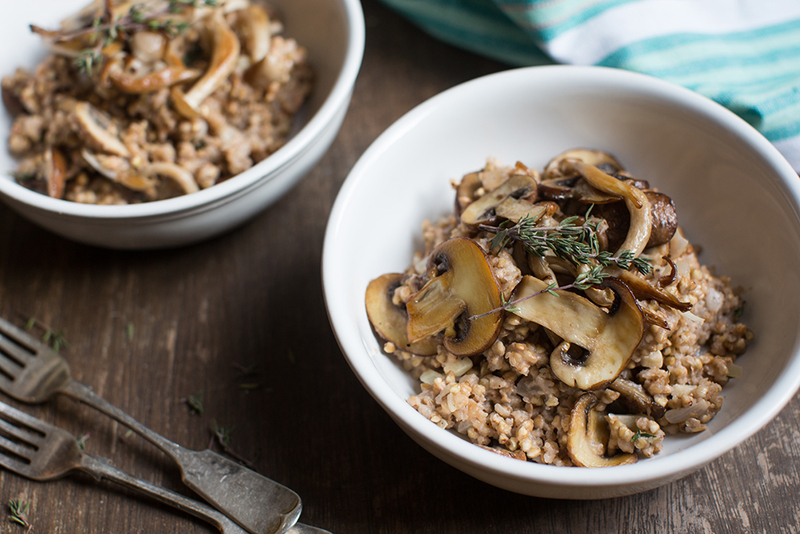 Mix half the mushrooms in with the buckwheat risotto, then spoon the risotto into bowls and divide the remaining mushrooms on top. 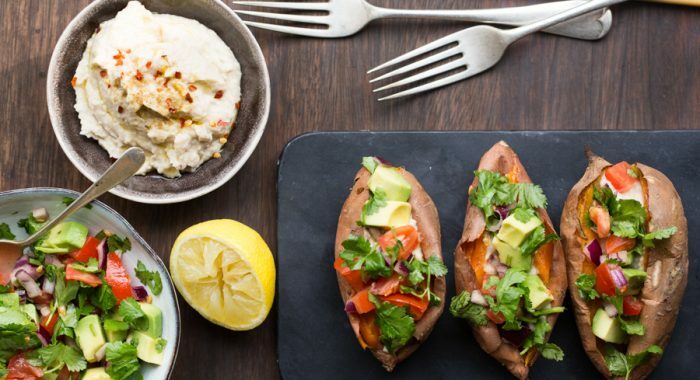 You can serve on its own or as a side dish.